Accept no compromises. Be ready for any shot with the rugged and versatile 1 NIKKOR AW 11-27.5mm f/3.5-5.6 zoom lens. Jump in the pool with the kids, keep it by your side while skiing, shoot gorgeous wide-angle landscapes, and even dramatic portraits, without ever changing your lens. Waterproof, shockproof and ready for adventure, this zoom lens is built for life. Don’t tell just half of your story. Keep shooting from your kayak, while rappelling down a cliff, or riding a waterslide with the kids. The 1 NIKKOR AW 11-27.5mm f/3.5-5.6 zoom lens is ready for all of life’s moments. Waterproof down to 15 metres, it captures rich beautiful colors with the Nikon 1 AW1's Underwater White Balancing. Rugged shockproof construction withstands up to 2 metre drops. Be ready for life’s spontaneous moments. With the 2.5x zoom range of the 1 NIKKOR AW 11-27.5mm f/3.5-5.6 zoom lens, you can shift from flattering candid portraits to stunning landscapes in an instant without changing lenses, even in extreme conditions. The lens is Ideal for outdoor adventures, snorkeling, boating, family events, or anytime you want versatility paired with rugged hassle-free performance. Express yourself creatively. Capture tack-sharp action shots and beautiful portraits in a variety of light with the wide aperture range of the 1 NIKKOR AW 11-27.5 mm f/3.5-5.6 lens. 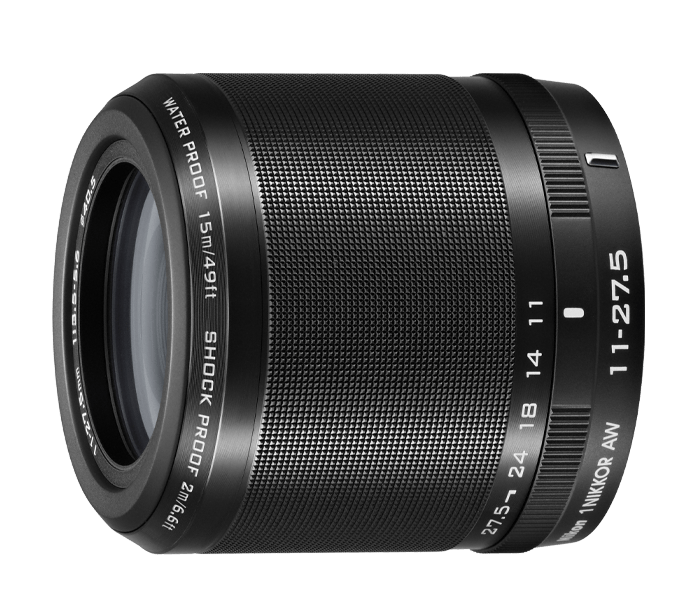 The f/3.5 maximum aperture delivers the fast shutter speeds needed for action shots or low-light occasions, such as at sunset. The shallow depth-of-field creates portraits with velvety-soft backgrounds.